common name for the Moraceae, a family of deciduous or evergreen trees and shrubs, often climbing, mostly of pantropical distribution, and characterized by milky sap. Several genera bear edible fruit, e.g., Morus, (true mulberries), Ficus (the fig genus), and Artocarpus, which includes the breadfruit and related species. The related hemp family, whose plants do not contain latex, were formerly included in this family. The mulberry family is most important as the basis of the silkworm industry; silkworms feed on the leaves of the mulberries (genus Morus) and sometimes of the Osage orange (Maclura pomifera). The white mulberry (M. alba) has been cultivated in China since very early times. In the Middle Ages it began to replace the black mulberry (M. nigra), which had been grown by the Greeks and Romans and, from the 9th cent., by the people of N Europe for silkworm culture. In Greek legend the berries of the white mulberry turned red when its roots were bathed by the blood of the lovers Pyramis and Thisbe, who killed themselves. Both the white and the red mulberry (M. rubra, native to North America) have been cultivated in America since colonial times, but the lack of cheap hand labor prevented the establishment of a silkworm industry. Mulberry fruits are tender and juicy and resemble blackberries. In the South the fruit of M. rubra is made into wine and is considered a valuable agricultural and wildlife feed. The Osage orange, also called bowwood because it was used by the Osage tribe to make bows, is a hardy tree native to the S central United States. Its fruit is used as a natural insect repellent. Cultivated widely, often as a hedge plant because of its spiny, impenetrable branches, it is a source of a flexible and durable wood and of a yellow-orange dye, from the root bark, that is similar to the more widely used fustic (Maclura tinctoria). The heartwood of fustic yields a yellowish or olive dye, also called fustic, that has been used chiefly for dyeing woolens; it has largely been replaced by synthetic aniline dyes. In its native habitat of Central and South America the fustic is also a timber tree. , common name for the Loganiaceae, a family of herbs, shrubs, and trees of warmer climates, including many woody climbing species. Some plants of this family are grown in the United States as ornamentals, and several are sources of medicines and poisons. ..... Click the link for more information. family is sometimes also called upas. , species of fig (Ficus bengalensis) of the family Moraceae (mulberry family), native to India, where it is venerated. Its seeds usually germinate in the branches of some tree where they have been dropped by birds. , fig tree (Ficus religiosa) of India held sacred by the Buddhists, who believe that Gautama received enlightenment under a bo tree at Bodh Gaya. A slip of this tree was planted at Anuradhapura to become one of the oldest known trees. ..... Click the link for more information. , class Magnoliopsida, order Urticales. 50 ft (15m) Delicious berries have powerful antioxidants, cancer prevention, life extension, cleans blood, strengthens kidneys, hearing, vision, diabetes, constipation, anemia, graying hair. The berries are great for improving vision. The bark is a laxative- leaves are an amalase inhibitor so they block the breakdown of carbohydrates into simple sugars, so it acts as a diet aid by preventing you from being able to absorb the carbohydrates. Root tea is used for tapeworms, urinary problems, bowel problems, diarrhea, dystentery. Sap used externally for ringworm. You can collect the leaves in the fall, dry them and use them as tea. Leaves used for heart conditions, cholesterol, liver problems (cleans liver), cancer, digestive issues. It is said there is almost nothing the leaves, bark, and gum resin boiled as tea cannot help alleviate from the body. The berries are great when dried. Mix with nuts and grind into pulp and make into "candy" balls. Male and female trees required for fruit. Any of various trees of the genus Morus (family Moraceae), characterized by milky sap and simple, often lobed alternate leaves. Instead, as the finale of the performance nears, the mulberry tree reminds us that it is we humans who must be pitied. Mulberry trees and mountains have and will land in the sea. pentagona is limited by the lack of information on the genetic relatedness of mulberry tree hosts. She decided to grow her own groves of mulberry trees filled with the spinning worms. The mulberry tree was chosen for its poignant link with the hospital's Mulberry Suite, which provides award-winning end-oflife care for patients and their families and was part-funded by grateful relatives and friends in recognition of the care their loved ones had received. Recently under new management, the Mulberry Tree in Stockton has reverted back to the name by which many of us remember it; The North Eastern, but what was its original name? Mulberry leaves are an essential food for silk worms, and historians have documented silk production in Lebanon back to the sixth century when the mulberry tree flourished as a result. 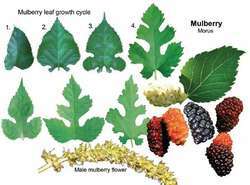 So I would suggest a mulberry tree because they look beautiful and the fruit is delicious. On August 25 this year an emergency order was placed on three more trees - a Chilean Pine, also known as a Monkey Puzzle tree, an Atlantic Cedar and mulberry tree - after Mr Tuck made his access road application. ORSTAGE Hall is an impressive Grade II-listed country mansion house set in around seven acres of grounds Outside, there are extensive gardens with a 500-year-old mulberry tree and well maintained lawns. BLOOMING OLD: CV One's operational support officer Garry Pittaway inspects the 250-year-old mulberry tree, believed to be the oldest tree in Coventry. Could this be city's oldest tree?